This is a blog post from 2012. Apparently, not all information in the post is valid anymore. Please contact your travel agent or friends to find out or go to the passport office to get your passport! This post was published on the Cambodia Daily. If you’ve been living in Cambodia for some time, you know how difficult it is to live here if you don’t have a lot of money to accommodate the needs of those in power. If you were born Cambodian, then you also know making a passport here isn’t very cheap like neighboring countries such as Laos, Vietnam and Thailand. To get a passport within 1 month or 50 days or nearly 2 months costs $135 (including the service of having your photos taken); 2 weeks: $290, 3 days: $380, 1 day: $480. – Come to the passport department and park your bike inside, if you have a car, park it somewhere else, as there doesn’t seem to be space for your car. It opens from 8am to 10am (morning) and 2pm to 4pm (afternoon). – Bring your national identification card, family residence document and birth certificate. – Keep $4 with you. I really mean it. It could be 4 one-dollar notes, because you don’t want to be scolded for giving them a big note and for them having to go look for change for you. – If you get a travel agent to make it easier for you to get a passport without having to spend hours there, you have to find him. But if you’re on your own, find an application form to fill in your name, nationality, age, parents’ names and occupations. Remember that the birth certificate and family residence book are significant to help you get through this phase. If the broker is there, she/he is willing to fill it in for you. The broker will also ask for the two documents as well as your national identification card (ID). – Make a copy of your application form and staple the original paper and the copy together. – Go to the counter close to the photo copy machine or ask people where to go next. They’ll tell you. That counter is on the right side of the entrance door of the building. If you are there all by yourself to give the form, the passport officers have the habit of tossing your application below others’. If the broker is there, they’ll make it very quick for him, therefore for you. After inspecting the name and basic information, they can point out if there’s some inconsistency, but if there isn’t, they will give you number tags. – Enter the building with your number tag. With your broker’s help, you might wait for 3 to 5 minutes or even less while others who are on their own can wait forever. There are very few rows of seats for those who wait; some even sit on the floor. There is a passport official sitting opposite the seats calling names every 5 seconds. Once he calls your name, he stamps your paper, and do keep in mind that the number will be important for the next step to take till the end of the process. Don’t forget to leave the number tag and insert it on the metal bar you find on his table. – Look at the number on the paper he stamps and gives you. There are about 6 counters, one of which you have to go to next. For example, I saw number 4 on the paper, and I had to go to counter number 4. There, I met a very unfriendly passport officer who shouted at those who were unfamiliar with or new to place heir left and right thumbs on the red scanner. Face your paper down on the table. You are then demanded to place your left thumb first and then right thumb on the scanner as long as you can till he tells you to stop. – Take the paper (that consists of the original and copy application) which the scanner officer stamps. Leave him in peace, and go straight to another room which is the only room in sight after the scanner counters. Give $4 (12,000 Riel or 4 one-dollar notes) to the official seated at the table on the left when you enter the room. Don’t expect the room to be spacious — it can accommodate only just about 20 people a time. Therefore, you can easily find the table where you are supposed to pay for your passport photo. The photo official will then imprint a tick with a pen on your paper, and you take it and go to a photo booth of the NUMBER that you were assigned earlier. You can have a look at the front page of your paper, and you’ll know what number it is . There are only 6 photo booths, so it is not tough to find yours. Give the official your paper, and go sit on a chair opposite his camera. His computer might look like it came from Stone Age, but you can’t help but think this is Cambodia. – Make sure your hair doesn’t cover your ears; otherwise once made, you’re asked to take another picture again. This is a problem common among women. You won’t like a stranger to ask you to toss your sideburn backward, will you (for gals)? – Get your paper back once the passport photo official stamps yours. Don’t go to another room yet; go to the photo-printing counter two metres away from your photo booth as you have to wait for your photo which will be pasted onto your paper by an official. He calls your name, and you take the paper to another room. 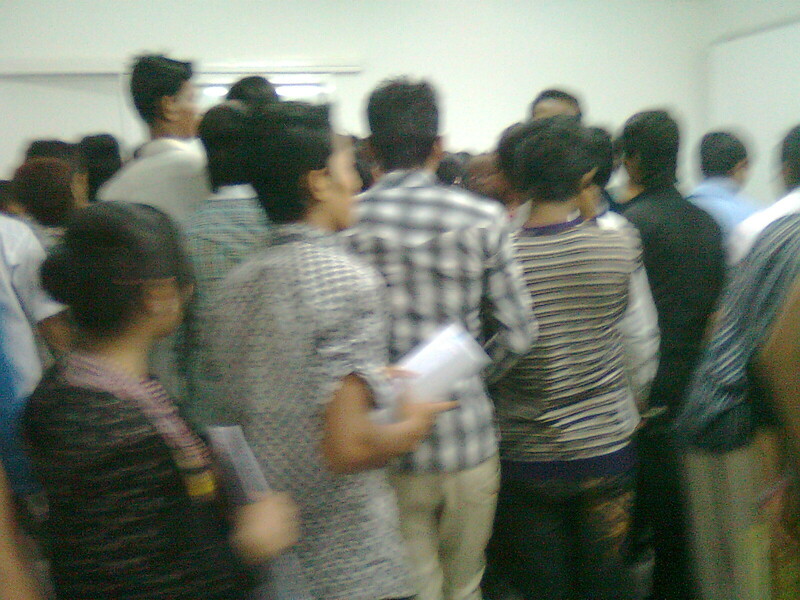 – Enter the door next to the photo printing table, and go straight to two tables. Just go to one of them, and put your paper down on one of the officials’ tables. This is one of the most hilarious moments you’ll ever have in your life. The official asks you what your name is and probably your parents’ names. If you can’t tell your name correctly, you are advised to go back to the beginning. Now, you should learn to pronounce your name correctly in this “interview” section. Minors (less than 18 years of age under Cambodian rules) are advised to bring their guardian or parents along. This passport official was surprised and said,“Hey, you’re only 14 years old – too young to make a passport” at a girl standing next to me. “Since when can’t a 14-year-old girl make a passport?” I thought to myself. – Face your paper down on the table or on top of other people’s forms, and wait until the height-measuring official calls out your name. You’ll find a long wooden measure stick attached to the wall. It is about 2 metres tall, and those who are taller than 2 metres have no way to make it through this stage, I guess. Take your shoes off, and lean on the wall near the measure stick. The man will tell how tall you are by way of his naked eyes or educated guess. – Take the paper he hands to you after he stamps it, and go to the next counter with the NUMBER you were assigned earlier. I stuck with number 4. Face the paper down on counter 4, and stay there till the official reads through your document, signs and stamps it. He then tells you to leave through the exit door. Don’t take the paper with you, as he keeps it. I’m compelled to write this down because the two times I made my passport were as hard. The passport office lacks signs, instructions and guidance. I was reminded this important piece of information. There was no way you could go to the passport office, and make a passport without help from a broker. As I said, you’d forever waiting for nothing because your application would be tossed below other files that only come later than yours. Do remember that the passport officials share the rice pot with the brokers, in Khmer meaning they work together for mutual monetary benefits. I was also told that the brokers from tour companies pay a lot of money to the officials to get things done. Brokers here can be passport officials themselves or the travel agents from tour companies. I tried calling both of them to see ranges of prices only to be informed by one official from the passport office that he would never cause any conflict with any travel agent after I asked him if he could help me. 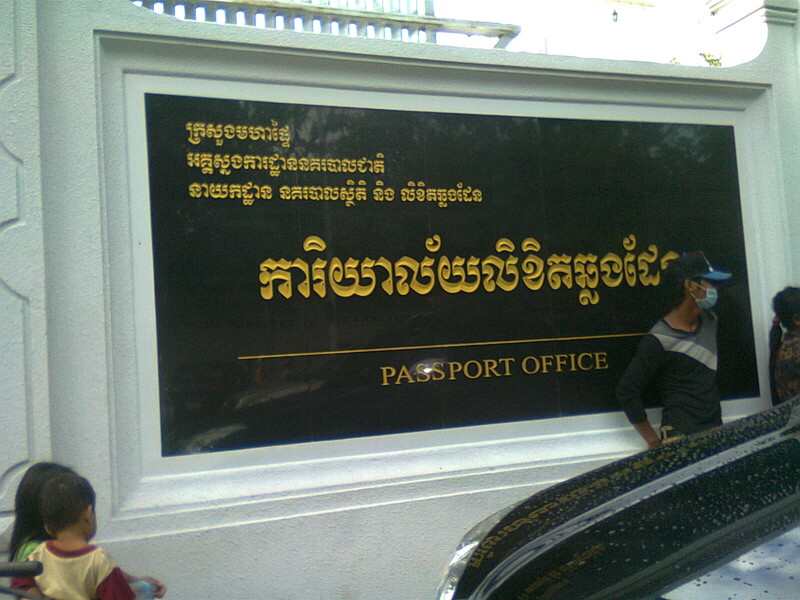 Earlier, I had asked a travel agent from the biggest tour company in Phnom Penh to get my new passport done in one week. “I wouldn’t want to break our rice pot together,” he plead on the phone. It’s even ridiculous that your broker might not even have time to tell you what you are going through in the next minute at the passport office. I helped several people get to the next step — it was a total chaos. And, such a messed-up system really pisses me off. The process of doing it, as we describe it as ‘red tape’ is really “red tape”. I was told that it would take me 30 minutes to make it, but it turned out that it was close to 3 hours that day even I would have to pay 280$. Article 51: The Kingdom of Cambodia adopts a policy of Liberal Democracy and Pluralism. The Cambodian people are the masters of their own country. All power belongs to the people. Thank God, the situation is not as messy here in India. One does not have to spend a good part of their lifetime waiting in front of the counters to get the passport, but things work in a matter of seconds if you have a travel agent along! Hope you’d get your passport soon! And this is in Cambodia. The most difficult is when a Cambodian is living abroad (ex. for studies, because he married a foreigner or works abroad…) : the Cambodian consulates and embassies can not make a new passport ! So if your passport expires, you have to go back to Cambodia to ask for a new one. And as you are living abroad, the price is even higher. This is a specificity of Cambodia, because almost all consulates from any country in the world can make passports, except Cambodia, guess why ? Here it is guy, you said you paid 280$ for the whole process. May I know how much for each step and for the broker you hired? It’s seem this like everywhere in Cambodia. Even to get the certificate from the education department. We have to spent our value time if we don’t pay or have someone known you inside. Thanks for such a value experience. I don’t want to say this, but here in Cambodia, if we want to save our times, let the money does everything. Hi Panharath, I was wondering how can I obtain a Cambodia passport if I don’t have any documents since my parents lost all of them when we came to the states? Thank You! Thanks for sharing. I am preparing to make a passport also. I was about to surfing on Google ” how to get an immediate passport”, but no need cus it’s here. Recently, I am also asked by my friends to make it ASAP before hand. They think that it might be useful for a little income like me. Thus, from now on after reading your blog, I start to save money to own one. When bureaucracy work work well in Cambodia? In general, Cambodian likes to complicate things. But there are reasons behind it! Extorting is one! The red tape and lengthy procedures are designed to generate illegal fees. The victim and the perpetrator are both in denial that such things ever existed, while most put the blame on the culture and poverty. This is Cambodia –get used t it! Thanks for the detailed posts; it was useful as I’m going to have my passport made soon as well. So do you suggest I get it done through a tour agent or by myself, with 2 the normal 2-month waiting time to get it…. I did experience this, but I had a broker with me at that time, so I was not scolded by those uneducated officers. I was shocked when I saw many officers there cursed on those people. Noticeably, I saw a man was cursed so badly by an officer who was in charge of taking photo. “Are you a jackass or a stupid person? you don’t know what side is left and what side is right?”, the camera officer said to the man who didn’t face straightly to the camera. If it was just a passport who was expensive but birth certificate, ID card.. for all administrative process you need to pay. Just incredible.. 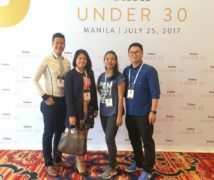 Thanks for sharing meaningful experience. In Cambodia, everything is getting more and more expensive. When I applied for student passport at the first time in the year 2004, it cost $20 because I had a letter from the Ministry of education to prove them, but now they charge more. …2004 I don’t know how much does it cost for normal passport.Normally in China, my friends applied for passports, it cost about $35 per passport and it take six weeks. It always cost more and more expensive to do something…… I mean cost of living. anyone have a phone number for contact info on current status of passport applications. or any website links ? for second passport do u need start the whole process over an pay the crazy high fees as the first one? What are the formal requirements for getting the passport? That is not clear from this article. Hi there, my wife and my new born baby girl are trying to record our doughter in to her passport but police told them the machine is broken and it will be sometime untill they fix it, how could that be true, is this a trick or is this real, help me to find out please, l can not do so much since l am working in my country and l dont have time to go there and wait for this, can anyone help? i want get a passport but i don’t know how is it? i have a girl friend and she live in Cambodia. i want go to meet her. and i am from India. how can i make my passpport and visa and reach there? and most important how to get a guide who can process my passport fast and easy and can arrange all ture. how much it all will cost? it will be very great if anyone help me. 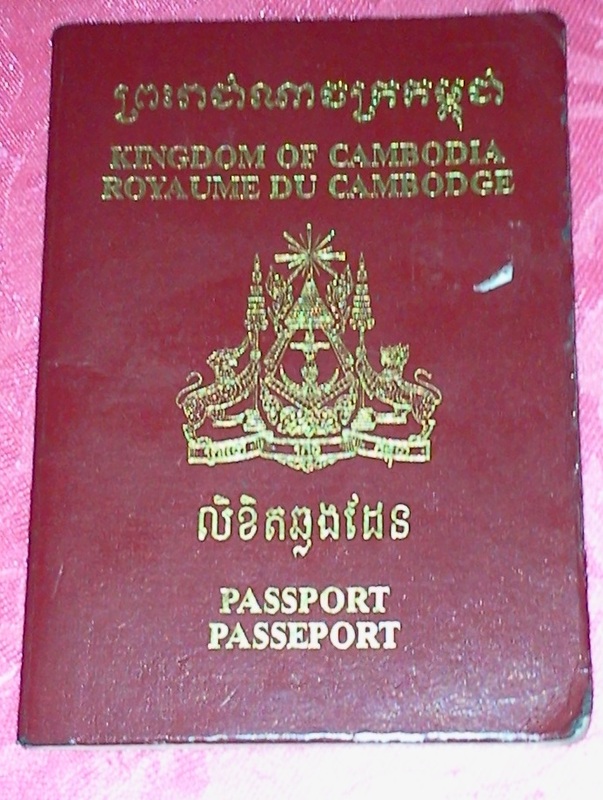 Can u believe it, those corrupt b*stards at the Passport Authorities in Phnom penh actually told my Cambodian wife to pay $600.00 for a passport for our 11 month old daughter who was born in Cambodia, their reason for charging so much is because “The mother is cambodian and the father is a British Citizen”, can u believe how F*cking hopeless these cambodians in governent departments are?” They know there is no other way you can get that passport without paying them whatever they are for, really they expect our baby girl to find $600.00 for a bloody passport that lasts 3 years? Like ALL poverty stricken countries, greed will always ruin the society there. Adrian, the best to approach this issue is to meet a travel agency based in Phnom Penh. I don’t think that this should be difficult. The agency doesn’t charge that high like these corrupt passport officials. Wow! I am currently looking for information of getting a passport for a Cambodian friend and I found this. Good information! By the way, does anyone know how to get a marriage certificate in Cambodia? Such information isn’t usually readily available on the Internet. I’d suggest you talk to your wife’s village or district chief to see how it can be done. 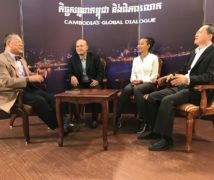 Cambodia has imposed a certain restriction on interracial marriage between a Cambodian and a non-Cambodian. As far as I’ve heard, to marry a Cambodian woman you’d need to earn a certain amount of salary and the list goes on. Good luck with obtaining the marriage certificate. If I hear of something, I’d definitely post it on my blog or @wheninphnompenh. All the best to you and your wife! I am considering to get a passport but feel so scare plus the expensive cost. @Sokheng: The process and service are much better and faster now. You pay $115 for your passport, and you’ll get it within 1 month and 10 or 15 days or less. But, if you want it faster say, in 2 weeks’ time, you pay $170, and 3 days’ time, $220. Good luck. Kill all the corrupted mother fuckers cambidians and viet descendent who are in power, replace with a real educated leader and democratic one. I hate them, they are really assholes. Fantastic discussion ! I am thankful for the points . Does anyone know if my assistant can locate a sample IN Form I form to edit ? There are a few expat forums at which you can post this question, Brook! Feel free to send me an updated one! Hey Ron, please note that this post was made in 2012, so please speak to your travel agent. Can my Cambodian partner ( Female ) apply for her first passport in Phnom penh through an agent., she has her id card and her residence documents / form. She would like to avoid all the local corruption etc in her village. Thanking you in advance for your reply. She should avoid working with an single agent that’s not attached to any travel agency. Please contact a travel agency in Phnonm Penh to help her make her first passport! It doesn’t cost an arm and a leg anymore! Thanks for sharing this. But I still no see how much of making passport fee by these day. Could you tell me? I bet its still about 100 bucks. However, please check with your nearest travel agency.